As a well-known entity of the industry, we are offering a broad array of Exterior Emulsion Paints. The offered emulsion paint is processed by using optimum quality chemical compounds and modern methodology as per the industry standard. Our given emulsion paint is tested on different parameters of quality so as to supply perfect range. In addition, customers can avail this emulsion paint at market rates with quality packaging. Capitalizing on our in-depth industry expertise, we are offering a comprehensive range of Paints such as Acrylic Emulsion, Coating , Furniture Enamel Paints, Water Based Primers, Anti Corrosion Coating and Primers Paints. We provide our range in various colors to our clients as per their requirement. Furthermore, our range is widely used in various industries such as, automobile including both 2 wheeler and 4 wheeler, white goods, home appliances, hand tools and engineering industry. We are backed by a state-of-the-art manufacturing unit equipped with advanced machines and instruments that ensures our smooth production process. 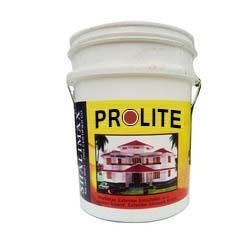 Owing to the features of our manufacturing unit, we are capable of producing 950-1200 tones of paints annually and thus we are catering the bulk orders of our buyers within a stipulated time frame. Moreover, our organization is segregated into various departments such as product design unit, production floor, quality control department, R & D unit and sales and marketing department that help us in managing all the activity in a organized manner.